Jeffrey Thomas (left to right), Randy Wilson, Charlie Thomas and Derrick Hall pose for a portrait at Central High School in Beaumont on Wednesday, April 23, 2008. 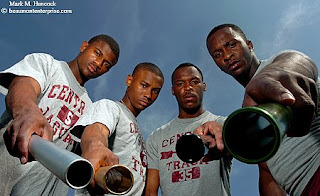 They are the Central's 4X100 relay team and are headed to the Region III track and field championships in Huntsville. PJs make lofty goals to keep motivated. Sometimes those goals are elusive. They don't even seem possible. One of my personal goals fell into this category - until today. When I was hired at The Beaumont Enterprise, I promised I was worth my pay. The only quantifiable measure I can access is print sales. So, I latched onto it. My goal was to sell more than the rest of the photo staff combined. To make it fair, I didn't push image sales or pad folders to increase sales. I wanted people to buy images because they wanted the images. My only promotion was a link from the copyright notification on this blog to the purchase site. Additionally, the images from Hurricane Rita were only available on request for various reasons I don't fully understand. I've chased this goal since I arrived. At times I was within $50 of my goal and other PJs would nail some great images. Each dollar they earned put me two dollars behind. It's been frustrating. For the record, the income from print sales goes to the company. Therefore, I have no financial interest in print sales. However, I do have an interest in braggin' rights. 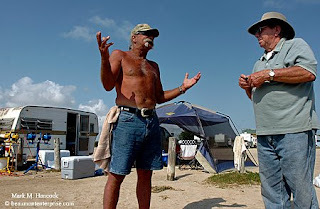 Lacy Wallace of Anahuac (left) talks with Jack Reynolds of the Gilchrist Community Association (right) at Rollover Pass in Gilchrist on Friday, April 25, 2008. Reynolds is trying to get new members to join the non-profit Gilchrist Community Association. Brothers Terry Baughn (left) and Charlie Baughn (right) fish at Rollover Pass. The non-profit Gilchrist Community Association pays $1,051 each month for sanitation and dumpsters. They currently only have enough funds to maintain the pass through the end of June. If funding isn't received soon, they may need to fence off the area to prevent the public from coming to the pass area. 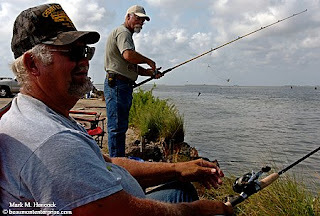 Please read, "Rollover Pass might need to fish for funds to stay open" by Christine Rappleye. Deer move near the brush at The Pointe Apartments in Beaumont on Sunday, April 27, 2008. 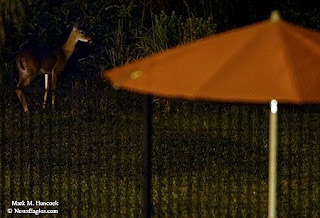 A deer looks up from grazing near the pool at The Pointe Apartments. The top photo reminds me of a cave painting. It's strange how life goes in circles. The first week after Fay and I moved to Beaumont, I was amazed there were deer munching on the grass a few feet from the apartment. 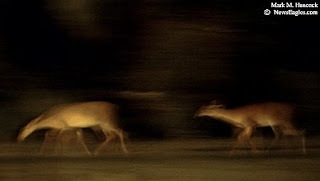 After Hurricane Rita, the deer vanished for a while. Now, three deer appear. So, I looked them up in my "Medicine Cards" book (Page 53). Deer means gentleness. The book states, "Apply gentleness to your present situation and become like the summer breeze: warm and caring. This is your tool for solving the present dilemma you are facing." The deer helped us get a good start here in Beaumont. I hope they're wishing us bon voyage as we move back to Dallas. 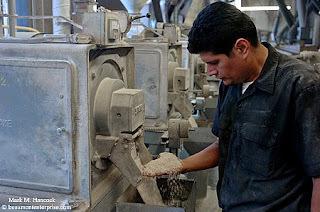 Head miller Eddie Carlin inspects rice at Beaumont Rice Mills in Beaumont on Thursday, April 24, 2008. Rice prices have hit an all-time high this year as the price to produce the rice has soared. 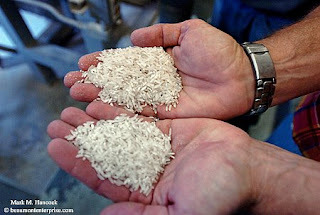 Louis Broussard, Jr., president of Beaumont Rice Mills, compares two levels of milled rice. Although there is a shortage of rice worldwide, Broussard said there wasn't a shortage of American-milled rice. The mill is Texas' first rice mill. Please read, "Is the world running out of rice?" by Dan Wallach. Keynote speaker A.B. Bernard, president of BGI Congractors in Beaumont, refracts through the Chamber Volunteer of the Year award during the annual Greater Beaumont Chamber of Commerce Awards Ceremony at the MCM Elegante Hotel in Beaumont on Thursday, April 24, 2008. 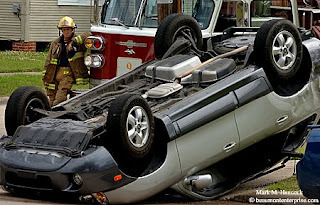 Beaumont firefighter Jeffrey Nesom waits for a wrecker at the site of a two-car injury-collision near the corner of Magazine and North Main streets in Beaumont on Thursday, April 24, 2008. Fayrouz got a great job in Collin County. I'm very proud of her. This means after three years in Southeast Texas, we're moving along. Yup, Fay and I are moving back to Dallas. I presented my resignation Thursday morning, so it's official. As of June 1, 2008, I'll be a full-time freelance photojournalist based in Dallas. I'm already working a few angles, but I can't really do anything concrete until I'm back in Big D.
When Fay and I were cyber-dating, we once daydreamed that she would get a great job in America, and I would become an "artist." She reminded me of the conversation tonight. So, this is what may happen. I'm not sure. At the moment, this process feels like a zero-gravity ride. I expect to land on my feet, but this is simultaneously startling and exhilarating. Whatever happens next is best. I'm preparing a going-away slideshow of images from the last three years. I'll post it on May 16, 2008, which is my last work day. Yes, it will be long. The next installment of the Black Star series will post around May 1 and the final piece of the series will run around May 15. They'll post the following day on this blog. I've been holding several freelance commercial shoots this year. I'll post them between the time we leave Beaumont, and I start producing work in Dallas. While this may mean I won't produce many hard news images during June, I'll probably have lots of extra time to write some important text posts. I may even start compiling this darn book I've threatened for the last four years. Uncertainty is the only thing I seem to be certain of today. But, it's best. 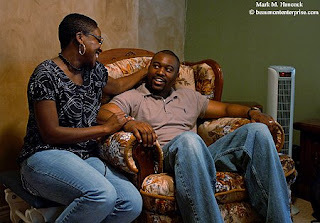 Jim Copeland (right) talks with his wife Tiffany Copeland (left) at their home in Beaumont on Thursday, April 17, 2008. Jim Copeland, a special education teacher at a federal prison complex in Beaumont, wrote a motivational book based on his life experiences. Jim Copeland (left) and his family gather at Copeland's home in Beaumont before Copeland's brother deploys to Iraq. 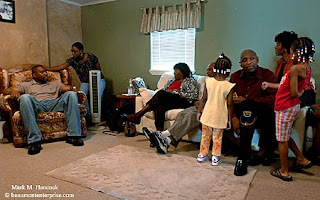 Family members include (from left to right) his wife Tiffany; grandmother Mary Cunningham; grandfather Billy Cunningham, Sr.; daughter Trinity Copeland; father Jimmy Copeland, Jr.; mother Sherrie Copeland; and daughter Essence. 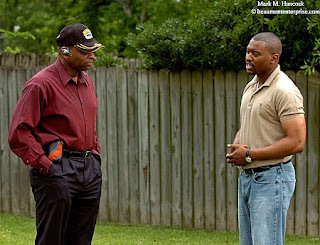 Jimmy Copeland, Jr. (left) talks with his son Jim Copeland (III) at Jim's home in Beaumont. Jim Copeland's motivational book is titled "Life is a Game." 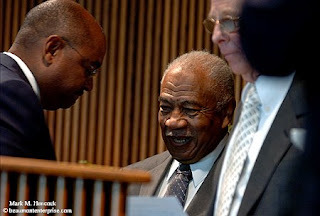 Judge Theodore R. Johns (center) is introduced by Sen. Rodney Ellis (left) during a dedication ceremony for a new statue at the Jefferson County Court House in Beaumont on Tuesday, April 15, 2008. Pat Willard, widow of Elmo R. Willard, (right) greets guests after a dedication ceremony for a new statue at the Jefferson County Court House. 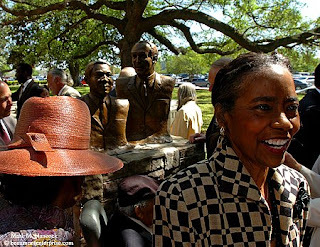 The bronze bust, titled "Crusading Lawyers," features local civil rights lawyers Theodore R. Johns and Elmo R. Willard. Fans scream for beads as one of the royal floats moves through the Crockett Street Entertainment District during the annual Neches River Festival parade in Beaumont on Saturday, April 19, 2008. 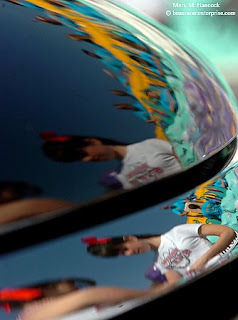 Cheerleaders separate beads as they reflect off a truck hood before the annual Neches River Festival parade. 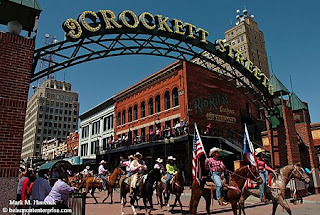 Horse riders carry the American and Texas flags through the Crockett Street Entertainment District during the annual Neches River Festival parade. 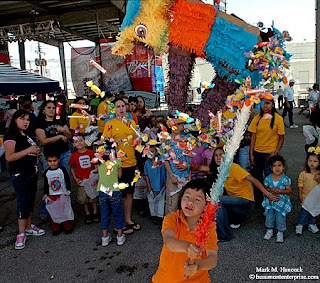 (Above) Marlon Keffer, 6, of Beaumont smashes open a candy-filled pinata during the Mercado Days Festival in Port Arthur on Saturday, April 19, 2008. 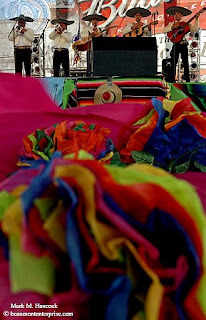 (Right) Mariachi Sol de America performs during the Mercado Days Festival in Port Arthur. 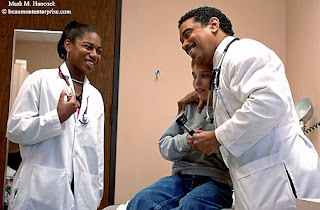 Central High School senior Alana Akers (left) observes as Dr. Bobbie Colbert gives a hug to Dalton Kirk, 9, of Fannett in the doctor's office in Beaumont on Wednesday, April 16, 2008. Akers earned the highest BISD score on her SAT exam with a 2290 of 2400. She plans to become a doctor. Jonathan Johnson, former funny car Rookie of the Year, earned his architecture degree from Texas A&M last year and moved to the dirt track with a new outlaw modified race car. He and his crew designed and built the car at his family's garage in Beaumont. Now he races most Fridays at Golden Triangle Speedway Park in China. 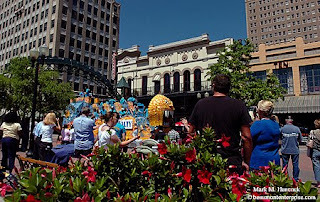 Please also see the photo slideshow and short trailer video. Please read, "Architect mastered straight lines as drag racer; now he's trying curves as dirt track driver" by Fred Davis. This is the short trailer for the Jonathan Johnson story. It's similar to the begining of the long version. Please see the YouTube version of this slideshow with music. Please set your YouTube viewer to 1080p to see the show in high definition. Lamar's Matt Gore (No. 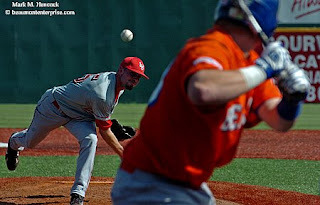 45, left) pitches the ball to Sam Houston State's Seth Hammock (No. 20, right) during a baseball game in Vincent-Beck Stadium at Lamar University in Beaumont on Saturday, April 12, 2008. Author Frank McCourt (right) laughs as junior Kalan Payne, an education major, (left) talks after a presentation in the John Gray Center Auditorium at Lamar University in Beaumont on Thursday, April 10, 2008. Payne explained her mother wouldn't allow her to read McCourt's book "Angela's Ashes" for eight years. Frank McCourt happens to be Fayrouz's favorite author. 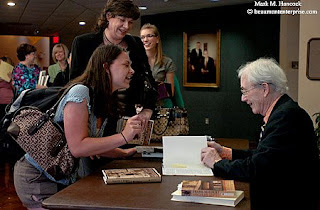 While I'm not thrilled with the image she picked (thus, it's not on this blog), you can read her post about McCourt autographing her collection. 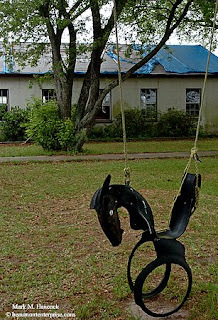 A tire swing remains empty near a building damaged by Hurricane Rita at Boys Haven during a groundbreaking ceremony for The Haven medical facility in Beaumont on Thursday, April 10, 2008. The property under the majority of the boys home was sold to construct a third medical facility in the city. 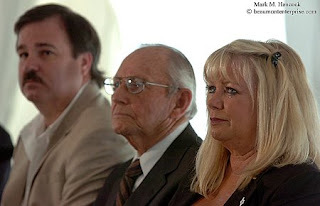 Allco Construction vice president Joe Ping (from left to right) and partner Gene Allen listen as Barbara E. Mlroy, exective director of the Southeast Texas Chaper of the Associated General Contractors of America, sheds tears during a groundbreaking ceremony The Haven medical facility at Boys Haven. Please read, "Plans for Mediplex not yet in full swing" by Colin Guy. PJs have a "life wish"
This is my first contribution to the Black Star blog. They prefer contributors to include anecdotes to establish authenticity. I'm still in the air about this approach. I'd like to hear what y'all think. Hurricane Rita was still blowing when I left the office. The streets were flooded. Those streets were located somewhere under the piles of trees, downed power lines, broken glass, misplaced roofs and twisted steel objects. 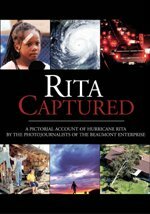 I had recently returned from covering Hurricane Katrina, so I was trained and mentally prepared for what I might find. I had a first aid kit, food, water, gas, spare tires, an inflatable raft, emergency illuminators and a truck full of other possible needs. I wasn't speeding, but I probably broke every other motor vehicle law in the department of public safety handbook. In one hour, I had driven the wrong way on freeways, driven in reverse up exit ramps and stopped on overpasses to make photos. I was the only person on Interstate-10 for probably 100 miles in either direction. I knew the police and fire department weren't cleared to leave "safe" locations yet. I also knew I was on my own if something bad happened. There was no way to communicate, no tow trucks and no emergency workers. I needed to stay alive if I wanted to tell this story. Many people think photojournalists have a "death wish." The opposite is actually true. We have a "life wish." If anything, we're trying to cheat death as frequently as we can. We feel most alive after we've survived a harrowing experience. Dying is easy. Living is the hard part. Telling the story is our goal, but the process itself is the drug making us go into forest fires, ride out hurricanes and wade through gators and toxic sludge. We tell the story to our readers and the story of the process to our friends. We're addicted to the speed of difficult situations. We think it's cool to see at f/22 and in slow motion when the adrenaline pumps. Otherwise, we wouldn't do this work. However, we must live to tell the story. A dead photojournalist has failed. Over the years, I've seen photojournalists make bad decisions. Some bad decisions cost people their lives. Most didn't. We can learn from both types. A bad decision can lead to serious injury or death. A bad decision means a photojournalist isn't going to make deadline. They'll either be in jail, the hospital or the morgue. None of these options are good. It takes training to avoid bad decisions. We must consider the options and choose the right one in advance. When the time comes, we'll only have one choice to consider: the good option. We should know exactly what to do, and how to do it, for any danger we're about to face. We must also decide what we're willing to do - and unwilling to do - to ensure we deliver the story. This often means erring on the side of caution rather than recklessness. At other times, it means we might need to take an undesired action to ensure our own survival. The situation dictates this to us. We must have already considered our options before this moment to avoid a bad decision. The key to surviving daring assignments is to consider as many dangers as possible before we're placed in those situations. If time allows, research everything there is to know about these dangers and ways to avoid being injured or killed. If a photojournalist is covering a story about a particular kind of animal, for example, we need to know a lot. We need to know the animal's habits (particularly regarding food and reproduction). We need to know when and where they can be found. We also need to know how they attack, when they attack and how to avoid these attacks. Furthermore, we might need to know how to survive in extreme cold or heat and how to keep our equipment functioning in these temperatures. We need to research heat stroke, frostbite, hypothermia, snow blindness and possibly simple things such as how to keep water from freezing or how to find water in a desert. Once we know this information, we can tell stories without putting ourselves or our subjects in serious danger. Next, we should train for our assignments. If we're unsure about mountain climbing, scuba diving, surviving in a combat zone or other dangerous environments, we need to train before we go. Not all assignments require training or allow training time. It's best to be in relatively good shape to handle most assignments without major fitness hurdles. Martial arts provide good fitness training with more practical benefits than spin aerobics. However, some assignments require additional work to ensure survival and image delivery. Efficient photojournalists can make stories while they train. Most communities have clubs for everything from rock climbing to diving to paintball. The photojournalist can acquire needed skills while creating a publishable story about the club. If anticipating a trip to a combat zone, it's better to have a few paintball bruises and a bruised ego, than a bullet lodged in a kidney. Please continue reading this series. Firefighters from several Southeast Texas communities help battle a blaze at the First Baptist Church in Kountze. The historic church was consumed by the fire. Please read, "Fire destroys Kountze church" by Fred Davis. 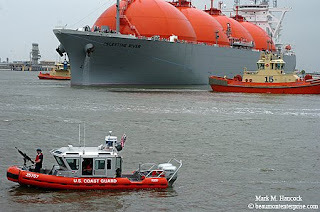 U.S. Coast Guard members provide security as boats maneuver the Celestine River LNG vessel into position during the first arrival of liquified natural gas at the Sabine Pass LNG on Friday, April 11, 2008. U.S. Coast Guard Lt. j.g. 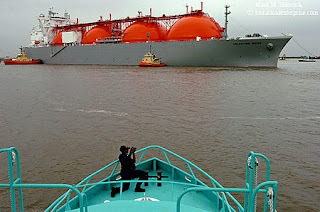 Niya J. Williams (bottom) makes photos from the deck of the Sabine Pilot II as boats maneuver the Celestine River LNG vessel into position during the first arrival of liquified natural gas at the Sabine Pass LNG. The 145,000 cm-capacity vessel transported the cargo from Nigeria to the facility owned by Cheniere Energy, Inc. 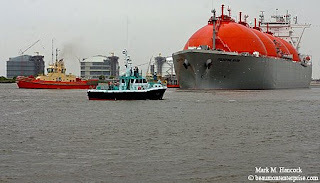 The Sabine Pilot (center) passes as boats maneuver the Celestine River LNG vessel (right) into position during the first arrival of liquified natural gas at the Sabine Pass LNG. Please read, "Massive tanker ushers in new wave of LNG supplies" by Christine Rappleye. 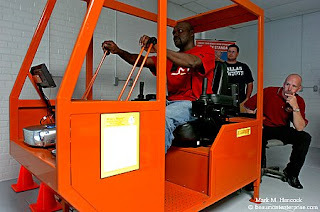 Instructors and classmates observe as Crystal Bass of Beaumont operates a crane simulator during a mobile crane operator training program at Lamar State College Port Arthur on Tuesday, April 8, 2008. Edward Randall of Silsbee (left to right) operates a crane simulator as Terry Brickerd and instructor Frank DiMeglio observe during a mobile crane operator training program at Lamar State College Port Arthur. 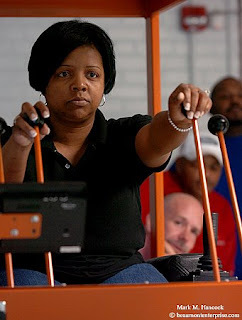 The four-week skills training program is provided through a grant. 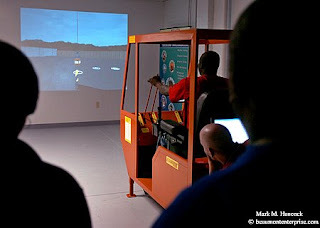 Classmates observe as Edward Randall of Silsbee operates a crane simulator at Lamar State College Port Arthur. If students are certified at the end of the course, they anticipate earning from $18 to $30 per hour upon completion. Please read, "Crane operator class at Lamar-Port Arthur gives students good wage potential" by Heather Nolan. 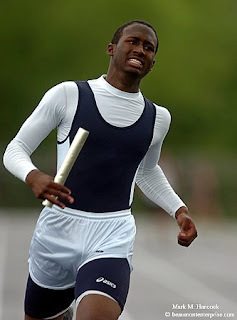 Ozen's Rishard Johnson starts strong in the boys 400 relay during the district 22-4A track championships at Dayton High School Stadium in Dayton on Wednesday, April 9, 2008. Central's Derrick Hall finishes his leg of the boys 400 relay before his opponents during a track meet at Dayton High School Stadium. 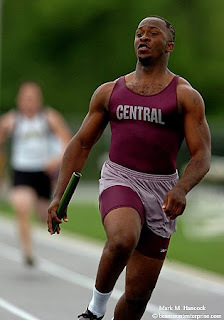 Central won the 400 relay district championship with a time of 41.88 as well as the boys overall district championship. Ozen's Che-von Martin finishes the boys 400 relay behind the leader during a track meet at Dayton High School Stadium. Ozen finished the 400 relay in 42.79 and earned second place. Ozen's A'Lexus Brannon finishes the girls 400 relay during a track meet at Dayton High School Stadium. Ozen won the 400 relay championship with a time of 49.52 as well as the girls overall district championship. 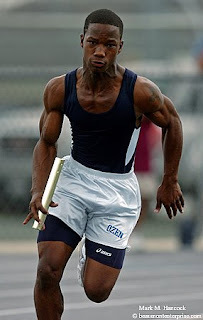 Please read, "Ozen girls, Central boys lay claim to 22-4A track championships" by Johnnie Walters. 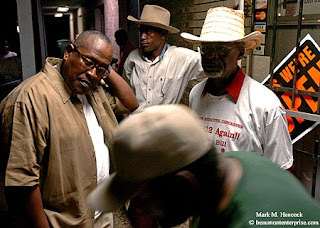 Port Arthur resident Majdi Hemad (right) goes into the Jefferson County Sub-Courthouse to vote during a runoff election in Port Arthur on Tuesday, April 8, 2008. Thurman Bill Bartie and Michael Sinegal are in the runoff election to be the Democratic candidate for Jefferson County commissioner, Precinct 3. 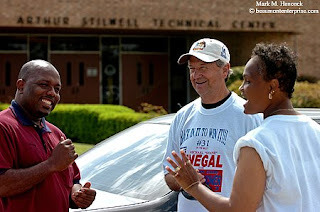 Kerry Thomas of Port Arthur (from left to right), Tim Champagne of Nederland and Yvette Sinegal, wife of candidate Michael Sinegal, (right) talk outside the Stilwell Technical Center in Port Arthur during a runoff election. 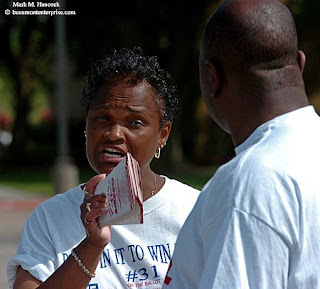 Yvette Sinegal, wife of candidate Michael Sinegal, (left) talks with supporter Kerry Thomas of Port Arthur (right) during a runoff election outside the Stilwell Technical Center in Port Arthur. Sinegal's campaign hit an early technical speedbump with the party until a visiting judge cleared his name to appear on the ballot. 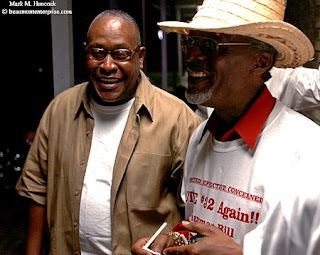 Thurman Bill Bartie (left) and campaign manager Rev. Glenn Alexander celebrate early election results during an election party at Bartie's election headquarters in Port Arthur. 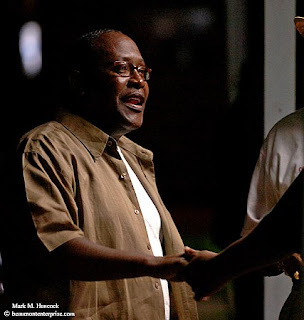 Thurman Bill Bartie (left) greets supporters during an election party at Bartie's election headquarters in Port Arthur. Thurman Bill Bartie (left to right), Charles Hicks of Houston and campaign manager Rev. Glenn Alexander consider options during an election party at Bartie's election headquarters in Port Arthur. Bartie had an uphill battle as well. In 2004, he was barred from holding judicial office in Texas. 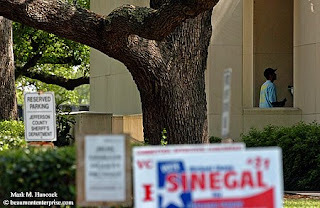 Please read, "Sinegal wins tight runoff for Precinct 3" by Sarah Moore. Christ Community Church pastor David Brett works in his office at the church in Beaumont on Wednesday, March 26, 2008. Several churches throughout the country use the Internet to solicit and answer anonymous questions about faith. 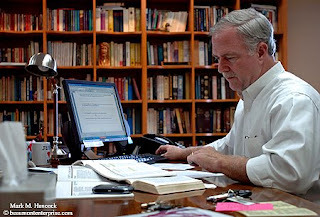 Please read, "OMG: Christian ministries use Internet." 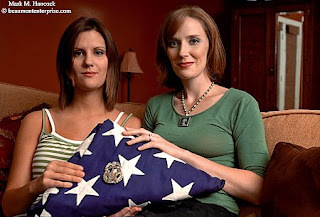 Amanda Hulsey (left) and Ashley Hulsey Behn (right) hold a flag with their father's badge at the family home in Beaumont on Friday, March 28, 2008. Their father, Beaumont police officer Paul Hulsey, was killed by serial killer Michael Larkhard on March 22, 1988. Please read, "Beaumont cop, father's death defined 'community's daughters'" by Dee Dixon. I was a guest presenter at the New York Press Association spring convention in Albany, NY on April 4-6, 2008. The images in this slideshow include the 4th Estate Gala at the New York State Museum and a walk around the block in Albany. Y'all can see the large version here. For an interesting view of this slideshow, it works OK with Metallica's "Enter Sandman." 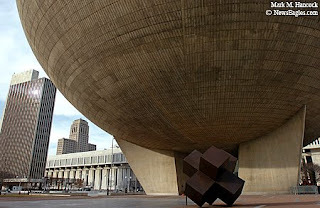 The Egg performance arts center contrasts angular construction of buildings in Albany, NY on Saturday, April 5, 2008. I'm flying back to Houston via Cincinatti today. I'll have a slideshow later this week from the New York Press Association spring convention. 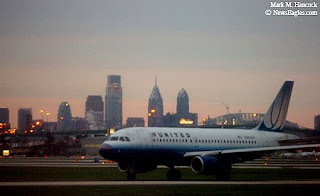 A United jets waits to take off at the Philadelphia International Airport in Philadelphia on Thursday, April 3, 2008. 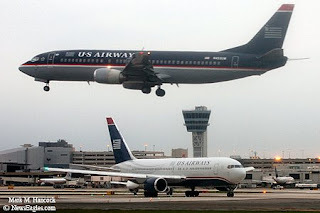 One US Airways jet lands while another jet waits to take off at the Philadelphia International Airport in Philadelphia. If you find the "Quick Tips" version to be visual hot sauce, please watch "Savory Tips to Improve Photos." It's the same presentation with more time to savor each image. Additional information is located on the All PJ-related posts section of this blog. Underlined topics are linked to previous posts with detailed information about the subject. Read equipment manuals three times. Know the difference between nouns and verbs. Pre-consider potential visual problems and solutions. Adjust plane of focus / angle. Adjust focal length for available light. When focusing manually, use one finger. Use alternative meter techniques: Sunny 16, palm, grass. Look for repeated action patterns. Shoot before collision - wind through reaction. Start with a clean background. Use subject and foreground to cover unwanted elements. Build a strong skeletal structure. Frame items within other items. Lead eyes with light and focus. Contain subject within rectangle (Golden Ratio). Avoid lights, reflections and voids. Research stories - find those with emotional elements. Have business cards, pencil and notepad. Shoot signs and rosters. Collect paperwork. Shoot name tags and numbers. Shoot story: lede, transitions, kicker, emotion. Get cutline information (5W & H). Get sound if possible. Shoot each angle (left, right, high, low). Be able to tell the story in one frame, three frames, five frames, 20 frames. Make unique (rare) images: access, subject, news value, combination. Use flash whenever it's helpful (no light, too slow). Use flash from 10 a.m. to 4 p.m. outdoors (fill light). Get flash off the camera. Try to keep flash angles from 45 to 90 degrees. Learn to light large areas. Use multiple lights to add depth. Be ready to manually calculate exposure (guide number). Understand inverse square law of light. Light painting with mixed light and flash (holiday lights, fireworks, lightning). Increase depth of field with artificial light. It's best to be courteous to defuse confrontations. The First Amendment provides the right for anyone to make photos. Anyone can shoot in public places, streets and sidewalks. Anyone can shoot where access is granted. Property owners have the right to deny access. Understand trespass law by state. Generally, PJs can shoot until asked to stop. Exceptions include military facilities and some areas within nuclear plants. Model releases aren't required for editorial use (but pubs may still require). Celebrities, politicians and emergency workers limited their right to privacy (injected themselves into spotlight). Felony criminals have no right to privacy until in prison. The right to privacy is seriously limited in public places. The exception to this is medical facilities (which include ambulances in some states). Business security isn't sufficient to prohibit photography. Trade secrets aren't in public view. Trade dress doesn't apply to photojournalism. Police may limit access, but can't prohibit photography (prior restraint). You aren't required to explain the purpose of your photography. Coercion and harassment by private security is a criminal offense in all states. Private parties have limited rights to detain and could face criminal and civil charges. Without a court order, private parties can't confiscate film. Ask what law was specifically violated. Ask for this person's name, and who they represent. Report rights violations to police. Call before the offender does. 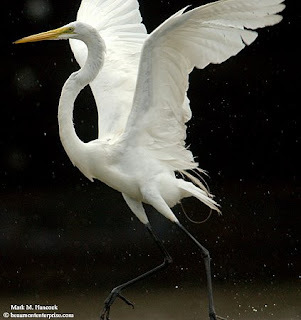 A Great Egret is startled by a ferry's horn near the ferry crossing over the waterway between Calcasieu Lake and the Gulf of Mexico in Cameron, La. on Tuesday, July 3, 2007. I'm flying to Albany, NY today for the New York Press Association Spring Convention. I'll be the old guy with the boonie hat and Texan accent. If you attend the convention, please say howdy to me after my presentations (I'll be freaking out until I'm done). On Friday, I'll be presenting "What is a Photojournalist" from 2:15 - 3:30 p.m. followed by "Quick Ways to Improve Your Images" from 3:45 - 5 p.m. (this one may run long). These presentations are at The Hampton Inn. This session is intended for non-photojournalists, who want learn about professional visual journalism. Learn what makes photojournalism different than other photography styles. Learn how photojournalism can be the most powerful form of communication. Learn how to effectively work with photojournalists to maximize reader impact. Put on the boots of a photojournalist for a while and understand why they love this work so much. This session is intended for working news photographers and photojournalists. However, it's helpful for anyone who makes images. This session includes fast, effective, proven techniques to improve everyone's images and make images pack more punch when they hit the newsstand. This session reveals pro techniques in story telling, composition, exposures, focus, access, cutline accuracy and more. 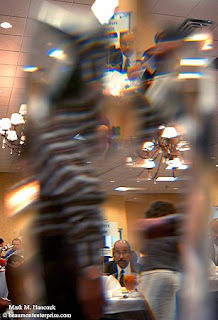 Some working knowledge of photography is suggested to keep up with this fast-paced session. While the first session states it's for non-PJs, some PJs may want to attend and think of it as a "Defense Against the Dark Arts" class. I'll explain what PJs do in journalism terms. For the record, think twice before you accept a speaking gig. The semester of speech I took in college never prepared me to give two separate back-to-back speeches this long. Whew! Since I've spent weeks getting these ready, I may turn them into a images-and-words training video later this year (minus the "where was I?" moments of the live version). For all three of this blog's regular readers, I'll post the Quick Tips cheat sheet on Friday. It won't be linked immediately and some of it may not make sense yet, but it may be helpful to y'all anyway. Next week I'll be finishing a multi-media sports project I've been working on since last year. It should post sometime the following week. I plan to be back on blogging target (daily PJ questions will return) around April 15th, which happens to be the first day I'll deliver a post for the Black Star blog. It'll be cross-posted here as well, but it may go over the heads of casual shooters. I may have some other interesting news about then as well. 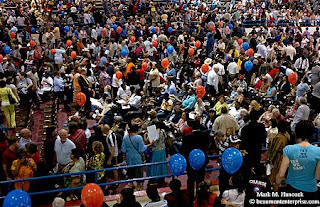 Conventioneers move toward their seats during the Jefferson County Democratic Party convention in the gym at West Brook High School in Beaumont on Saturday, March 29, 2008. Tatia Trusty-Landry of Beaumont (right) registers conventioneers during the Jefferson County Democratic Party convention at the West Brook High School gym. 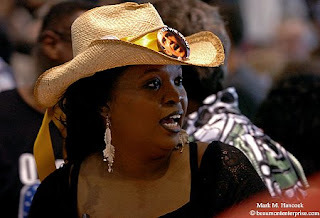 Tawana Cadien of Beaumont supports her candidate during the Jefferson County Democratic Party convention at the West Brook High School gym in Beaumont. 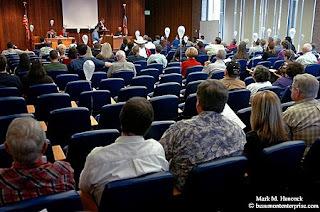 Conventioneers listen to motions during the Jefferson County Republican Party convention in the impaneling room of the Jefferson County Courthouse in Beaumont on Saturday, March 29, 2008. 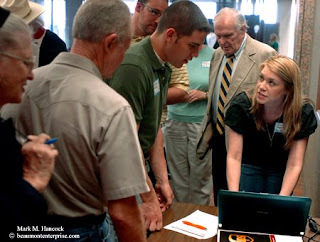 April Seymour (right) registers Jonathan Bradley (center) during the Jefferson County Republican Party convention in the impaneling room of the Jefferson County Courthouse. 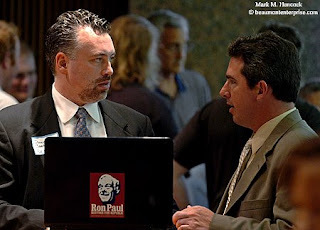 Doug Conner (left) talks with J. Shane Howard (right) during the Jefferson County Republican Party convention break in the impaneling room of the Jefferson County Courthouse.